Today is #MusicMonday, so it’s time to put the digital DJ hat on. 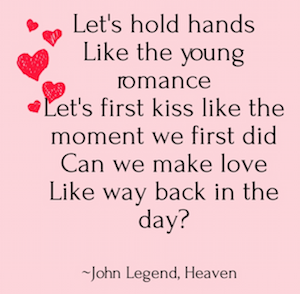 It’s also the birthday of singer/songwriter heartthrob and Grammy winner, John Legend. 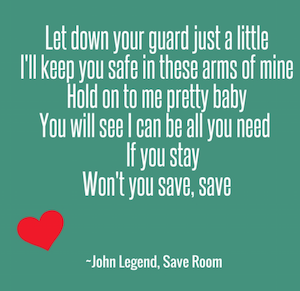 In honor of John’s birthday, we couldn’t feature just one Cyber Love Song for the week. 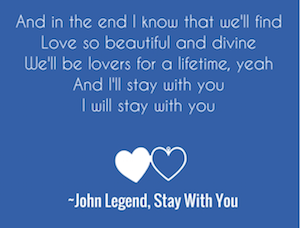 Here are five of his best romantic love songs, with some lyrics that will make you swoon. Happy Birthday John Legend and thanks for the music. Follow @JulieSpira on Twitter and sign up for the Free Cyber Dating Expert Weekly Flirt. It’s Music Monday and time to share one of the most romantic songs ever, “Sweet Love” by Grammy Award-winning singer Anita Baker. Today also happens to be Anita’s birthday. This song is so beautiful, that it’s frequently played as the first song at weddings. Listen to the lyrics and click replay if you like. Do you have a favorite romantic love song to share? Click here for more Cyber Love Songs. It’s time to put the digital DJ hat back on. Today is Pete Townshend’s birthday. He’s the lead guitarist from a great classic rock band, The Who. To celebrate his birthday and Music Monday, we’re featuring a sweet romantic song from one of his solo albums, Let My Love Open the Door —to your heart for our Cyber Love Song of the Week. The biggest highlight of the Super Bowl was the half-time show with Bruno Mars performing. His song Just the Way You Are is one of the most romantic songs and we’re happy to feature it as our Cyber Love Song of the Week. 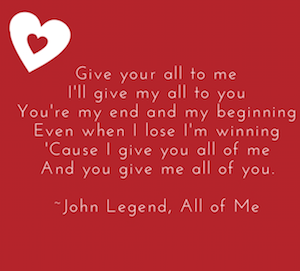 Enjoy these sweet lyrics and maybe even play it for your sweetheart on Valentine’s Day. 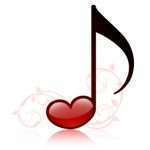 Do you have a favorite romantic love song? With all of the holiday festivities going on, it’s hard not to get in the spirit when listening to music on the radio and in the stores. Grab your elf hats and turn up the volume. We’re pleased to feature Santa Baby by Katrina as our Cyber Love Song of the Week. While we were all saddened by the death of iconic musician Lou Reed at the age of 71, on this Music Monday, we felt it was important to share one of his most romantic songs that he performed with his band the Velvet Underground. 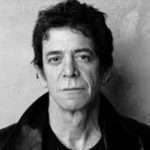 For our Cyber Love Song of the Week, we’re featuring “I’ll Be Your Mirror” in memory of Lou Reed. It will warm your heart as we say goodbye to Lou and remember his music. 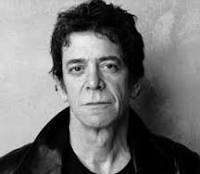 Do you have a favorite Lou Reed song? 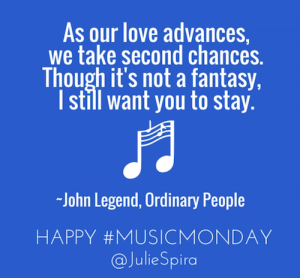 Listen to our other featured Cyber Love Songs and follow @JulieSpira on Twitter. Julie Spira is an online dating expert and founder of CyberDatingExpert.com. She began her career as the first female an-air personality at Classic Rock station, WAAL-FM, where she was found spinning many of Lou Reed’s songs on the radio, including “Rock and Roll,” “Take a Walk on the Wild Side,” and “Sweet Jane.” On Music Mondays, Julie puts her Digital DJ hat on and features a romantic love song in the Cyber Love Song of the Week. It’s time to put our digital DJ hats back on after a fun-filled St. Patrick’s Day weekend. We’re proud to feature our friend Katrina with the remix of her song, ‘Ready to Love’ as our Cyber Love Song of the Week. This upbeat song will help you get ready for Spring Fever. Over the weekend, I had the chance to see the play, ‘Backbeat.’ The show goes back to the beginning days of the Beatles in Hamburg, Germany. The musical is playing in Los Angeles, with the hopes of making it to Broadway. This week, we’re featuring ‘Love Me Do,’ the Beatles first hit single, which was released in 1966. Hum away to this great video below and share your favorite Beatles love song in the comments. All me to put my DJ hat on and enjoy this week’s classic video montage of “Something” by the Beatles. It’s a great way to start the week and may just put a smile on your face. 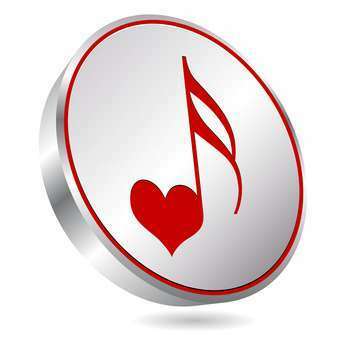 Do you have a favorite Cyber Love Song to share? Happy Music Monday and Happy Birthday to Kenny Loggins who turns 65 today. We’re featuring his pop song with Michael McDonald, “This is It.” Some believe it’s a love song. Others think it’s a break-up song. January is a time for reflection on your relationships. Either way, enjoy the music. Do you have a favorite Cyber Love Song? Julie Spira is a leading online dating expert, bestselling author of The Perils of Cyber-Dating, and founder of CyberDatingExpert.com. She creates irresistible profiles for singles on the dating scene. For more online dating advice, sign up for the Weekly Flirt, follow @JulieSpira on Twitter and on Facebook.com/CyberDatingExpert.